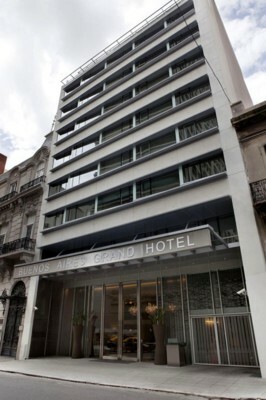 Located in the heart of Recoleta and inaugurated in 2013, the Buenos Aires Grand Hotel is a deluxe hotel featuring a contemporary style offering guests the luxury and latest amenities. Hotel services include an outdoor pool with an artificial current, a spa and fitness center, a gourmet restaurant and trendy lobby bar and lounge. All of the rooms feature working desks, minibars, 40-inch smart LED TVs, espresso/coffee machines, iPod docks, and Wi-Fi connections. The nine Deluxe Junior rooms are 239 square feet and offer one king bed or two twin beds. The 49 Deluxe Studios are 292 square feet and offer king or twin beds with the finest linens. The 31 Deluxe Suites are 357 square feet, also feature deluxe toiletries, bathrobes, hair dryers, safes and microwave ovens upon request.